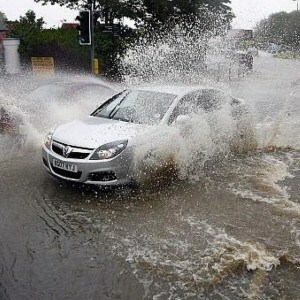 Roads up and down the country have been affected by torrential rain and rising waters so far this winter and, as a result, the Institute of Advanced Motorists (IAM) has offered some important advice to drivers on how to stay safe when facing these treacherous conditions. One of the most important aspects of road safety in wet weather is to properly plan journeys before heading out. Take the time to find out which routes are most likely to be worst affected and avoid them if possible. Heavy rain can often mask damaged road surfaces and potholes. It is therefore important for drivers to avoid potential hazards in the road – as there is no way to tell how deep these broken surfaces might be. Always remember to check lights, windscreen wipers and the state of tyres before embarking on any journey where wet roads and rain are a possibility. Switching to dipped headlights during heavy rain can help to avoid issues of glare for other drivers. Motorists should always remember to cut their speed when faced with adverse weather, as braking distances can be up to double their normal length in wet weather. Torrential rain can affect a vehicle's electrical systems. It is therefore important for travellers to pack a few essentials in case of a breakdown, such as a charged mobile phone and a warm blanket to wrap up in while waiting for rescue. Preparation is the key to safe driving in all adverse weather and drivers must therefore be prepared to face everything the elements have to throw at them each time they take to the roads.